These fliers can be located at the entry of the store. 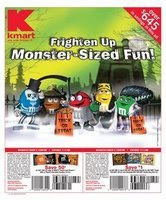 The front page has $1/1 coupons for bags of Halloween candy and inside there is a BOGO coupon for Dentine Ice gum. Thanks goes out to Cincinnaticents for this GREAT information! You can read more about how to use these coupons at Walgreens or Kroger on her blog ~ click here.